​FRISCO – US 380, which has been in the works since 2014, will wrap up the second phase of construction in December 2018. TxDOT started construction to widen the roadway from five lanes to a six-lane freeway with eastbound and westbound access roads. The first phase of the project started in September 2014 and ended in fall 2016 from Custer Rd. to Lovers Ln. 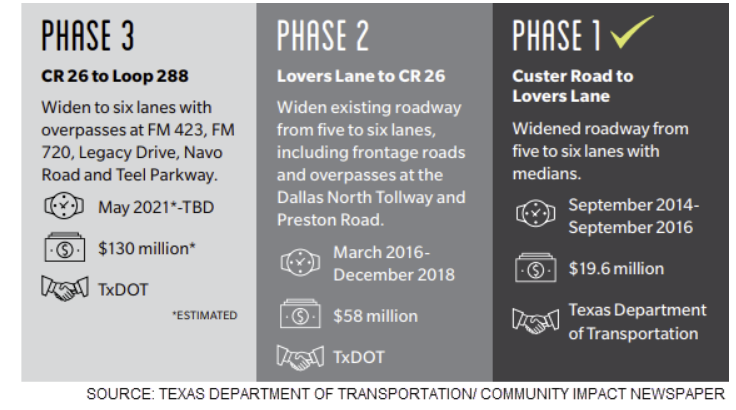 TxDOT began on the second phase in March 2016—a 2.6-mile stretch from Lovers Ln. to just west of CR 26. The third phase of the project is an almost 15-mile stretch starting in Frisco just west of CR 26 to Loop 288 in Cross Roads and is expected to begin construction in 2021.